Also known as Old Kinnairdy, Kinnairdy Castle is a fascinating mix of a medieval castle and 15th-century tower house begun by the Innes family. 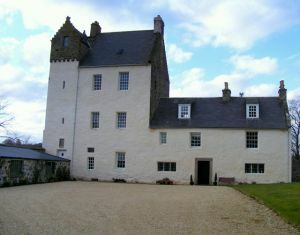 The castle stands 2 miles south-west of the village of Aberchirder, where the Auchintoul Burn meets the River Deveron. The castle began as a motte and bailey structure, with a stone keep surmounting the motte. A curtain wall surrounded the keep, which is now encased within the walls of the current tower. Around 1420 a six-storey tower was built in the north-west corner of the enclosure. Sometime after 1500, the house was extended with a wing to the east (this wing is called 'The Palace'). Around 1725 the top two storeys of the tower were removed to give it its current look. The castle was extensively restored several times, the most recent being in 1935. Near the castle is the ruin of an early 18th-century dovecot. 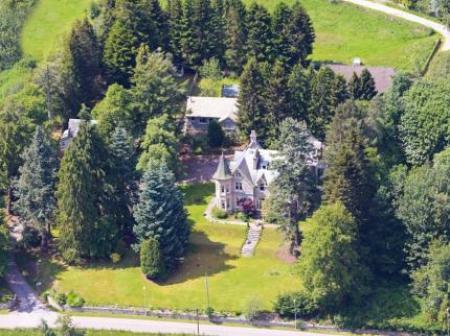 Interestingly, the castle is now back in the hands of the Innes family, after passing through numerous owners over the centuries. Among these were the Gregory's, a remarkable 17th-century family who produced no less than 12 academic professors, including David Gregory, inventor of the barometer.